Quote: A woman cooking herself a snack has been wounded after the bullets her roommate left inside the oven exploded and sprayed her with shrapnel. Aalaya Walker, 18, preheated the oven of her apartment in Tampa, Florida, on Monday to make herself waffles - not knowing that Javarski 'JJ' Sandy, 25, had stashed his pistol magazine with four live rounds in the appliance. Ms Walker was hit in the chest and the leg by shrapnel from at least one round. Don't know about you guys, but I always store my ammo in the oven. Keeps the kids out of it. I think this is the third time in the past year or so that someone has done this and it made it to the news. There was a story a few years ago about a grandmother that was going to make a frozen pizza for her granddaughter. Didn't realize that there was a loaded pistol in the oven. The round in the chamber cooked off first and fired normally through the oven door, through the wall of the kitchen and almost hit the grandchild that was asleep on the couch. Fortunately, since it was a semi-auto, it didn't cycle properly once it fired and jammed. Bullet fragments struck and lodged in Aalaya Walker's breast. She was able to pull some of the bullet fragments out, but had to be treated at St. Anthony's Hospital. Walker, 18, told police she went to her friends house and decided to make waffles in the oven when she became hungry. She said she preheated the oven and a few minutes later heard an explosion. That is when she noticed she had bullet fragments in her breast, thighs and knee area. Police interviewed Walker's friend about the gun. According to a police report, the friend told police the Glock 21 was in a drawer and the magazine was placed in the oven with four rounds in it. The friend did provide police with the melted magazine which they had discarded in a dumpster. Well... Either attempted murder or Incredible stupidity..... Should probably charge the roommate for something. Incredible. I don't know if I can fault the woman for this, really. How is she supposed to know? If you peek in the oven and it looks empty, why would you think otherwise? 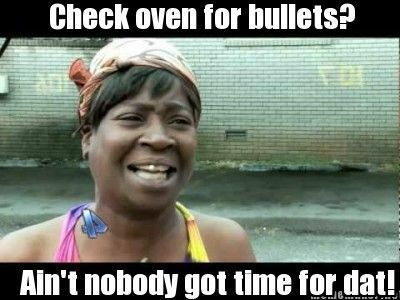 I know when I open the oven, I'm looking for pots and pans and not shining a flashlight looking for gun magazines. I would have ran out and I wouldn't have grab no shoes or nothing jesus.